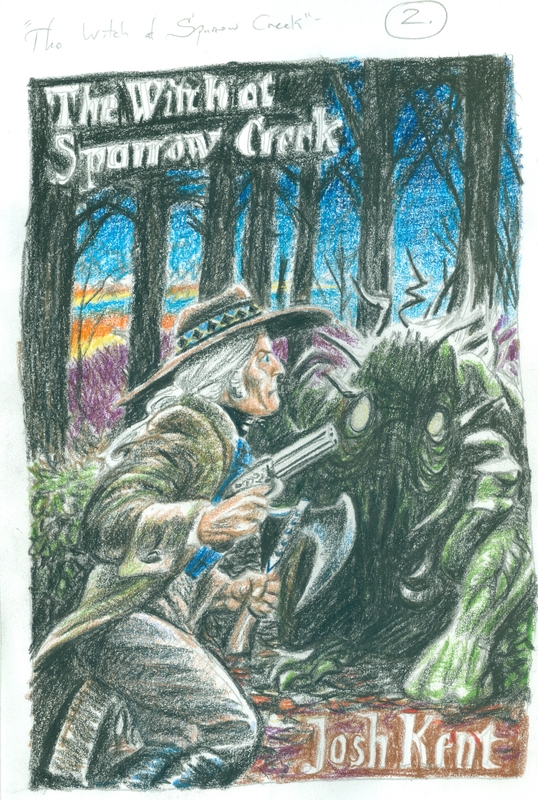 Award winning artist – Jason C. Eckhardt – thanks for the cover! One of the bigger joys of this book was getting to see the drafts of the cover art for the first time. Artist Jason C. Eckhardt gave light and shadow to people and places who had only ever existed in my mind! Just think of how it might feel to suddenly be looking at the face of someone you’d only ever pictured in your head… Thanks for an amazing, classy cover, Jason! Jason articulated the essence of the novel – and through his skill I recognized immediately the face and form of my main character, Jim Falk, surrounded by the rickety homes, stark wilderness, and suspicious citizens of Sparrow. I’ve never had the pleasure of meeting Mr. Eckhardt, but he’s a talent to be reckoned with. Check out his many accomplishments here. AND here! – Jim Falk engaged in combat with “The Spook” – Fantastic stuff! Thanks for your time, energy, and major talent, Jason!